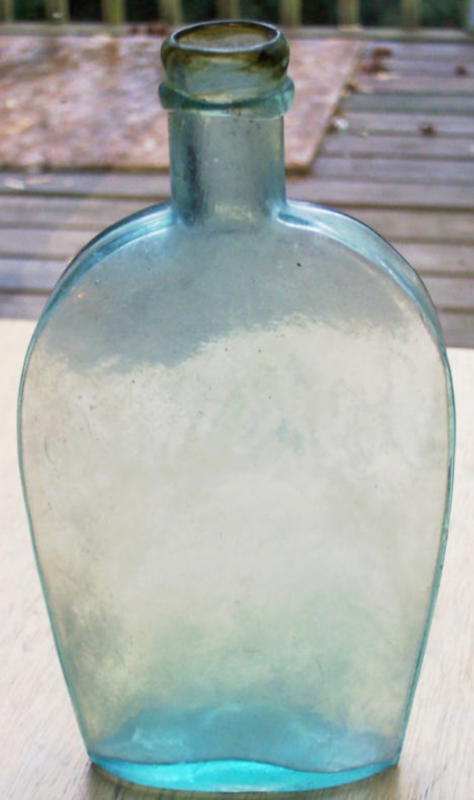 Pittsburgh Glass Works, founded by James O’Hara in the late 18th century, operated under a succession of management after 1840. 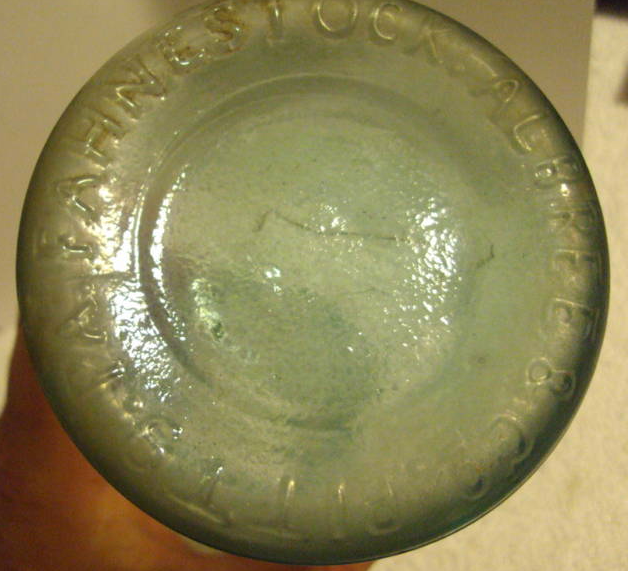 The glass works was leased to Fahnestock, Albree & Company during the period 1860 to 1863. 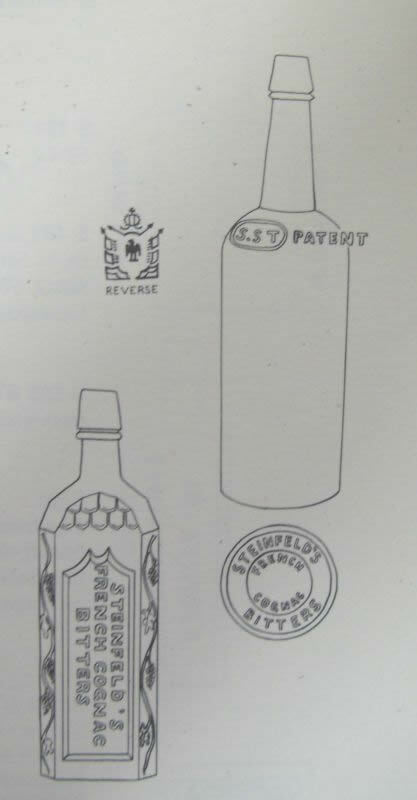 Helen McKearin reports no other details about this company except to say the Van Rensselaer found in his research only this company to match the “F A & Co” embossing found on several flasks and bottles. The embossing can be found on three Group 12 Union and Clasped Hands flasks: the GXII-40 pint, the GXII-42 half-pint and the GXII-42a half-pint. 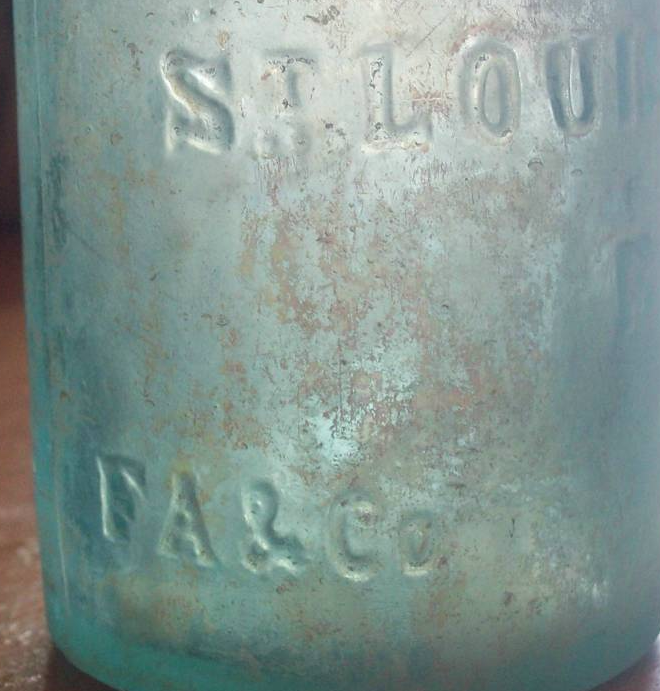 I have also found a similar aqua squat soda with the embossing H.GRONE & CO ST.LOUIS MO along with the FA & Co embossing. aqua squat soda marked H.C.SCHLIEPER & CO TERRE HAUTE IND is also marked “F A & CO” on the front near the base. I was recently going through some 19th century newspapers and other publications that I had not looked at in years. One such paper was THE STAGE, a leaflet of several pages about the theater in New York City. Perhaps it was a handout at theatrical productions. I was looking at a November 1870 edition. 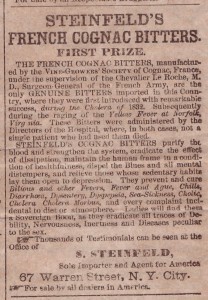 I was not expecting to find any advertisements that were antique bottle related, but much to my surprise did I find a big pitch for Steinfeld’s French Cognac Bitters. Of course! A medicinal bitters based on fine French brandy was in perfect company for the well-heeled theater crowd. 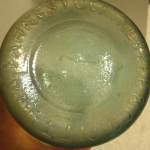 For bottle collectors, this is one rare find. Ring and Ham’s Bitters Bottles lists two different bottles, both of which carry a rare rating. 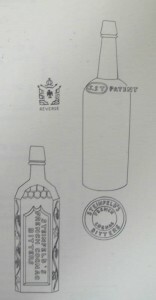 The first (S 185) is a plain cylinder marked SST Patent on the shoulder with a eagle and crown medallion and the base is marked Steinfeld’s French Cognac Bitters. 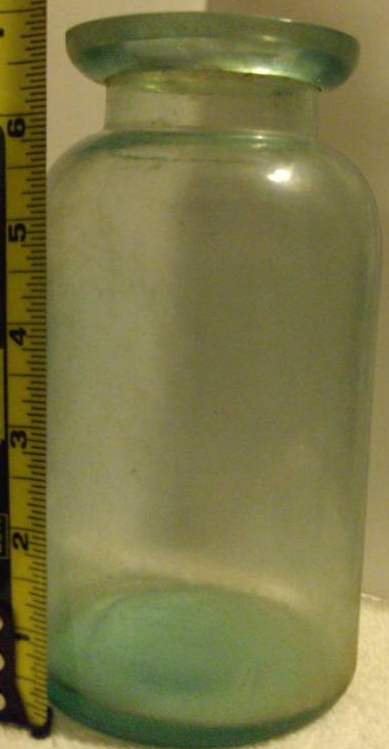 Notes for this bottle suggests it was believed to be made earlier than the 1850s. The other bottle (S 186) is an ornately decorated square bottle with grape vines along the corners and shingles on the shoulders. It is found in amber and golden amber. I searched auction records and found only 5 that have sold in the past 20+ years. Several were listed as damaged. 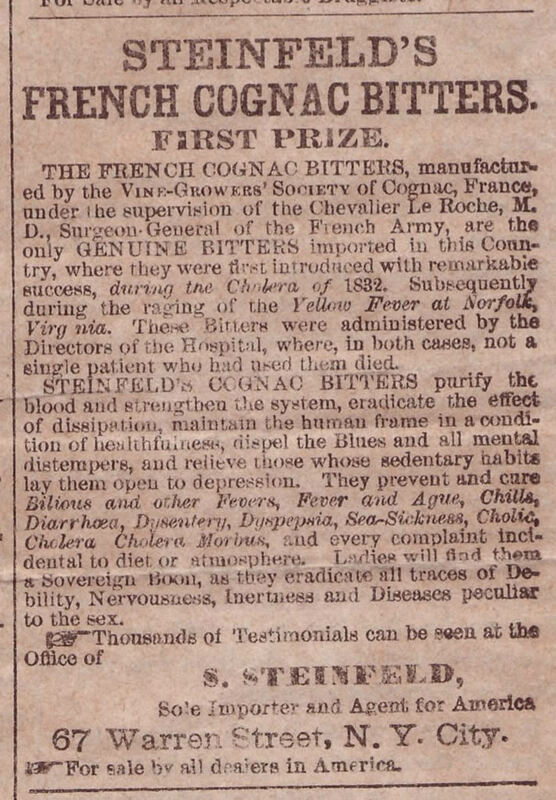 It is interesting that a company which started around 1850, won a prize at a Paris Exhibition in 1867 and was still advertising in 1870 – 20 years in business?! – has so few bottles left in existence. 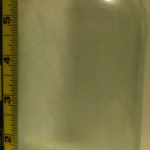 Below is a picture of the two Steinfeld bottles as shown in the Carlyn Ring/Bill HamBitters Bottle book. Incidentally, if you have any interest at all in antique bottles or bitters bottles in specific, you NEED this book. It is an incredibly comprehensive resource.